The Scottish Kinship Care Alliance submitted their final response to the last consultation on the Kinship Care Order in early October, raising a number of remaining concerns with the proposals in the Act. The full response can be read below. 1. Demand that the overdue review of financial allowances for kinship carers is released immediately (due December 2013), and possibilities for incorporating the recommendations into the secondary legislation are investigated (as recommended by the Stage 1 report on the Bill). 2. 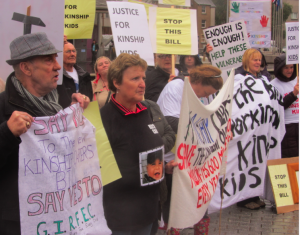 Demand an official review of the impact of the Kinship Care Order two years after becomes law, to gauge its success and the ongoing needs for support. 3. Build alliance of cross party MSPs who are concerned about kinship support, to raise questions on the Kinship Care Order, and debate the Act when it reaches parliament in January. The Kinship Care Order will be debated in parliament in January 2015 and become law in April. 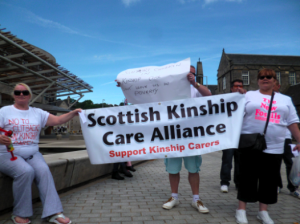 We continue to demand recognition and proper support for kinship care children and their carers across Scotland, recognising that they have comparable needs to children in other forms of state care. This entry was posted in Article, Uncategorized and tagged Buttle UK, care, children, Children and Young People Bill, consultation response, discrimination, foster care, informal kinship care, kinship allowance, kinship care, Local Authorities, policy, postcode lottery, psychological services, Scotland, scottish government, Scottish Kinship Care Alliance, Social Work on October 29, 2014 by Miriam Rose. – the eligibility criteria for support, which would only entitle ‘children at risk of becoming Looked After’. – the failure to legislate for a minimum financial allowance for all children in kinship care, instead leaving financial issues to the current overdue ‘financial review’, keeping it outside the legislation. – the amount of decision making on support left to the discretion of Local Authorities, which will promote an ongoing ‘postcode lottery’ of support, rather than ensure equal provision across Scotland. – the ongoing discrimination between the support offered to children in foster care, and children of comparable need in kinship care. – the limit of support for kinship children until age 16, while foster care children can receive support until 21. – the three year limit to ‘transitional’ support for children previously Looked After. 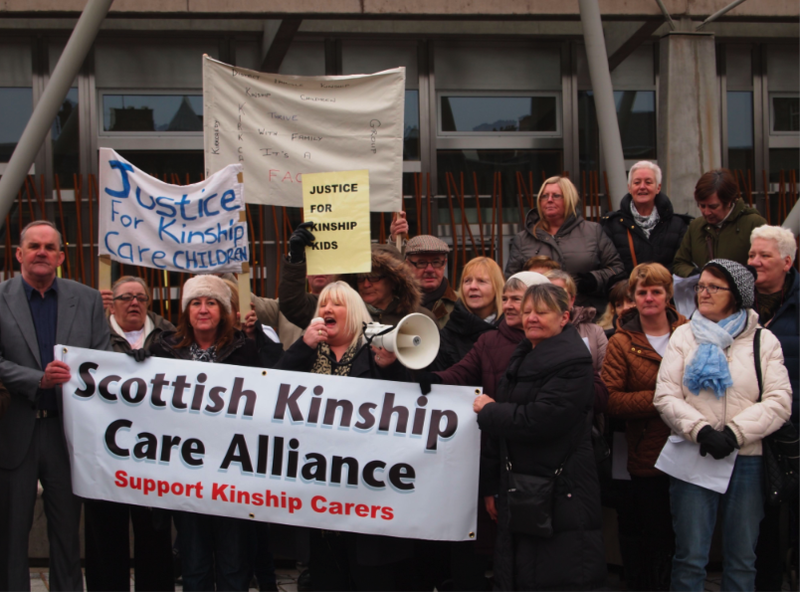 – the cost of obtaining a court petition for the Kinship Care Order, which will be high for the majority of carers who are unable to access Legal Aid. This entry was posted in Article, Kinship Care, News and tagged Buttle UK, children, Children and Young People Bill, consultation response, discrimination, foster care, informal kinship care, kinship allowance, kinship care, Local Authorities, policy, postcode lottery, poverty, psychological services, scottish government, Scottish Kinship Care Alliance, Social Work on May 14, 2014 by Miriam Rose. 5th March 2014. This article by Alliance Chair Anne Swartz appeared in the Guardian Comment is Free today. 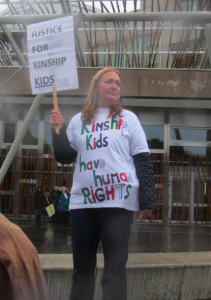 Kinship carers – relatives or family friends who permanently care for children who would otherwise be in the care system – held a large demonstration outside the Scottish parliament last week. They are rightfully distraught that, despite years of campaigning for recognition and support for the vulnerable children in their care, the Scottish government is planning to reduce, rather than increase, their right to assistance. 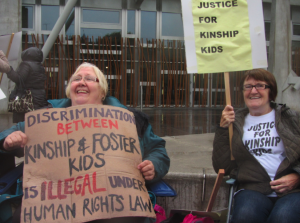 The children and young people (Scotland) bill sets out a new legal status called a kinship care order, which the government claims will finally recognise kinship carers in law and increase the support they are offered. However, a closer look at the proposals reveals they are billed as saving the Scottish government and local authorities money by reducing the number of kinship children with “at risk” or “looked after” status, which entitles them to crucial services and financial allowances. The financial memorandum of the bill states that only a fraction of those applying for the new kinship care order are expected to be entitled to start-up grants, the legal cost of applying for the order or a basic allowance to support their caring role. This entry was posted in Article, Kinship Care and tagged Buttle UK, care, children, Children and Young People Bill, demonstration, discrimination, foster care, informal kinship care, kinship allowance, kinship care, policy, poverty, psychological services, scottish government, Scottish Kinship Care Alliance, Social Work on March 6, 2014 by Miriam Rose. 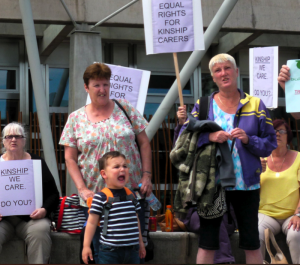 Today around 60 kinship carers and their supporters and children from across the Scottish regions protested loudly, chanting and singing outside the Scottish Parliament. They spoke to and leafleted MSPs arriving at Holyrood for the parliamentary debate on the Children and Young People Bill which took place at 2pm, urging them to vote for amendments which attempt to increase the support available to kinship care families in the Bill. 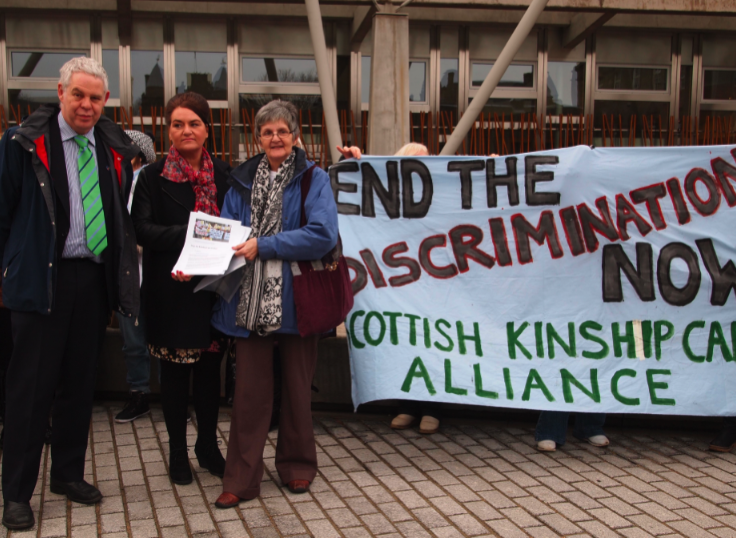 Kinship carers claim that if these amendments do not go through vital support for vulnerable children in kinship care will be cut. The demonstration was covered on STV, BBC radio (6.49mins in), BBC news, the Evening Times before and after the demo, Edinburgh Evening News and more. 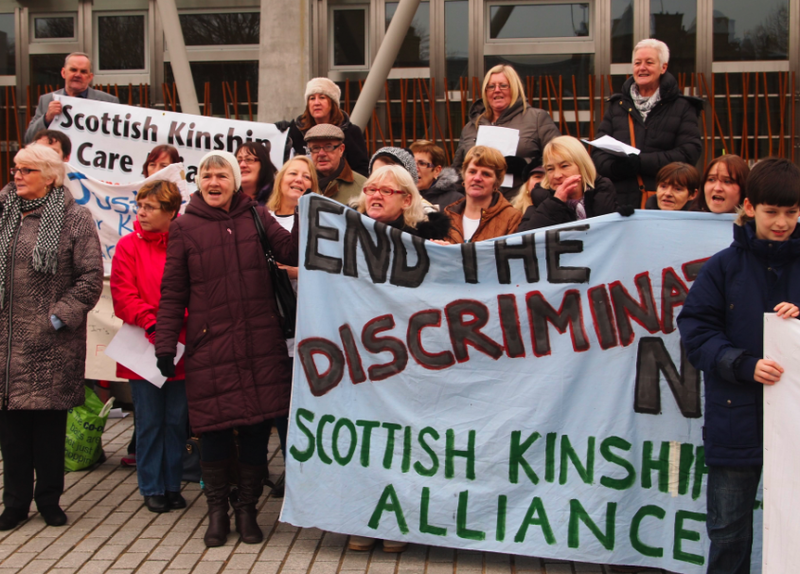 Kinship carers and the children in their care faced the cold weather today, waving placards and banners reading ‘stop this Bill’ and ‘end the discrimination now’. 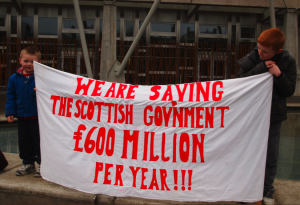 One banner pointed out that ‘we are saving the Scottish government £600 million per year’ – a reference to avoided care costs from keeping kinship children in the family. They chanted loudly using a megaphone and loud voices and sang versions of popular songs. A number of MSPs came down to meet and hear from the carers before going into the parliamentary session. 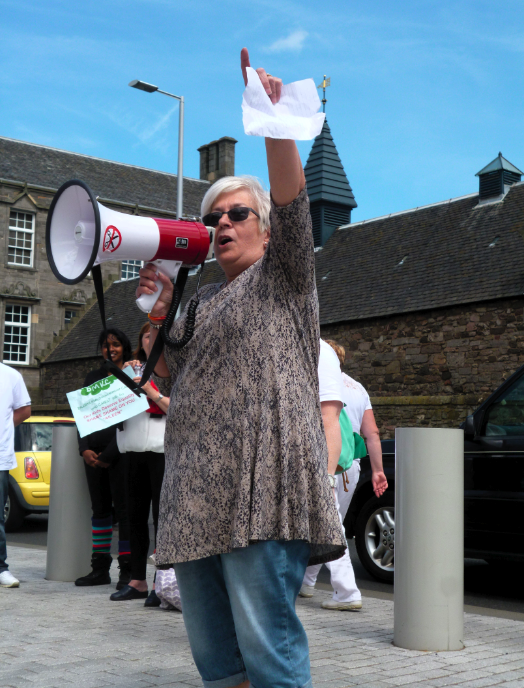 One commented that the demonstration could be heard inside the committee rooms! This entry was posted in Event, News, Protest and tagged Buttle UK, care, children, Children and Young People Bill, consultation response, demonstration, informal kinship care, kinship allowance, kinship care, petition, poverty, protest, psychological services, Scotland, scottish government, Scottish Kinship Care Alliance, Social Work on February 19, 2014 by Miriam Rose.